But lately, ‘homemaker’ is having a re-birth, both as a word and a lifestyle. I keep coming across women (and a very small handful of men) who describe themselves as ‘hipster homemakers’ or ‘radical homemakers’ or ‘new homemakers.’ They seem to be interested in claiming social and environmental value for the task of caring for one’s home, enlarging the concept of “homemaker” to mean more than just “chief vacuumer.” Shannon Hayes, she of the book “Radical Homemakers,” sees homemaking (which in her definition has expanded to include raising farm animals and making your own soap) as they key to a more sustainable way of living – Why buy cleaning products when you can make your own out of vinegar? Why drive downtown to eat out when you can roast a delicious chicken and play cards in front of the fireplace at home? (Well, I can think of a few reasons, but I’m not Shannon Hayes!). Other people I’ve talked to see claiming the label of ‘homemaker’ as a ‘screw you’ to a world that only values career and financial success. Some of these people do have outside jobs, but choose to identify themselves by their relationship to their home rather than their career. Others simply see the word as having been de-valued as women entered the workforce in large numbers in the 20th century, and are pushing to reclaim it in a positive way. After all, it is (theoretically) a gender-neutral word, which – unlike housewife – doesn’t define the person by their relationship to a spouse. Thoughts? Do any of you call yourselves ‘homemakers’? If so, what does it mean to you? 9 comments to What does ‘homemaker’ mean? I guess I don’t really call myself a homemaker (in the sense of describing myself that way to other people), but I like the term. 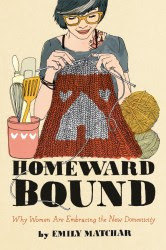 I like the way that it suggests that domestic tasks aren’t necessarily done for their own sake but as part of a larger project of home-making. I like that “homemaker” can be a gender-neutral term and also that it can indicate a role rather than an occupation (a person could be daughter/wife/mother/attorney/homemaker all at the same time). I suppose that conception of it runs the risk of watering it down: if anyone and everyone is a homemaker, what does the term really mean? But I say, yeah, let’s take back “homemaker”! Do other languages have terms that are etymologically similar to “homemaker” or is it a peculiarly Anglophone or American thing? That’s a really good question. In Spanish, it’s “ama de casa,” which is feminine, but could theoretically be turned male “amo de casa.” I don’t know if that’s ever really used outside of a joking context – Spanish Wikipedia tells me there’s an Argentinean sitcom of that name, about a stockbroker forced to stay home and (gasp!) take care of the kids and house. I don’t call myself a homemaker, really — more a stay-at-home mom, just because that’s what everyone else says. I do think the term has taken on a pejorative connotation (much like “housewife”) and that it’s not as gender-neutral as it probably should be, but yeah, I think we should take it back! Making a home is an admirable vocation. It’s just a little hard to own that, given our society’s partiality toward financial and career success as a measure of one’s worth. See for me there’s a huge difference between a stay-at-home parent and a ‘Homemaker’. Stay at home parents could be the type of people who spend their days chatting on the phone or catching up with the soaps. And not the handmade kind To be a homemaker is to be someone who genuinely puts hard graft into creating a lifestyle and home by hand. Homemaking is not about vaccuming the floor. Homemaking is just what is says it is, making a home! I was a homemaker for quilte a few years with grown children and a working husband, no stay at home mom about it. And frankly, I’m a terrible housekeeper.. I and a lot of my fellow students (in a dietetics program) were encouraged to join. Anyway, I’m really enjoying your blog – since nutrition is kind of an offshoot of home economics, I find all these topics fascinating. Totally! In fact, home economics as a discipline originally got started in the late 19th/early 20th century as a way of professionalizing housework and earning respect for traditional “women’s work”.